DNA testing for family history research has conquered many brick walls, but is it for you? Perhaps you are still deciding whether to not to test, or maybe you already have your results. In either case, Dave Robison’s two presentations will answer many of your questions and help you make informed decisions about next steps regarding DNA testing. What types of DNA can be extracted? What is the function of each type? What are the limitations of DNA testing? I’ve got my test results, now what? To share or not to share? The March 23 session will focus on introductory topics, while March 30 will cover more complex questions. Dave Robison, Old Bones Genealogy of New England, has more than twenty years of experience with genealogical research and has helped hundreds of people with his workshops, courses, and consultations. 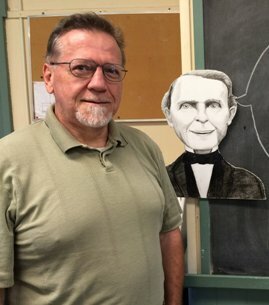 He is the President of the Western Massachusetts Genealogical Society and is active in many other genealogical associations. Please call to pre-register for one or both sessions: (413) 420-8107. This event was rescheduled from an earlier date. Sponsored by the Holyoke History Room.